I was always a little accident prone as I grew up. You know those annoying ‘ice breaker’ questions in meetings where you have to tell something most people don’t know about you, or something along those lines? Well my usual offering is that I’ve broken bones in all four limbs (not at the same time). And that I broke not one but three metatarsals before David Beckham made them famous. G, in contrast, has made it to five years old with barely an incident. No need for A&E trips, stitches, bandages, plaster casts or anything like that. Hell, our first aid kit sees more use on G’s dolls than it does on any of us! So I shouldn’t be too surprised, I guess, if C takes after her mother in ways other than her blue eyes and occasional grumpy tendencies. A few weekends back we made a long overdue visit to see one of my oldest friends from school and her husband, in their gorgeous house – quaint village, bags of character, tons of space, sun trap garden complete with vines, apples, cherries and herbs. And some decidedly non child friendly steps between the rooms. The steps were actually the first thing she said to me about the house. “It’s not very child friendly, we need to get some stairgates, but haven’t got them yet”, she said. “Be careful with C and the steps!” she said. Of course we listened, and we kept an eye on C with the steps. But hell hath no fury like a small child denied the ability to climb as she likes, and, perhaps inevitably, there was eventually a tumble. 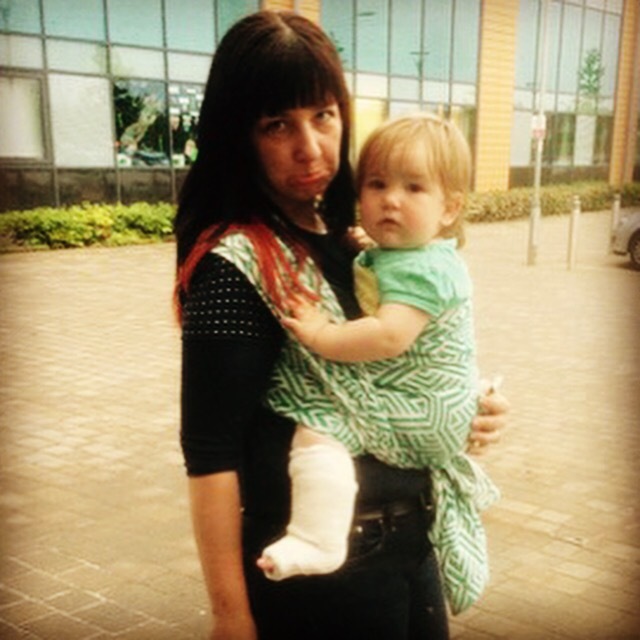 The tumble ended up with us in A&E awaiting an X-ray and subsequent cast. Yep, C had a buckle fracture in her leg. The NHS were, of course, fantastic. Our estimated 1 hour wait was filled with my friend and I nattering away catching up whilst C dozed in one of our slings, broken short by a triage nurse exclaiming ‘I’ve been calling you!” far earlier than we expected, as we nearly lost our spot. Sadly the dozing didn’t last, and C was, as is her way, rather unhappy about having to stay still for first the X-ray and then the temporary cast they put on. By ‘unhappy’ I mean she screamed her head off throughout and demonstrated a strength, even in the broken leg, that took all the doctors and nurses by surprise as she kicked and thrashed her way through the whole procedure. Eventually all was sorted and we headed back to the house for some much needed rest. 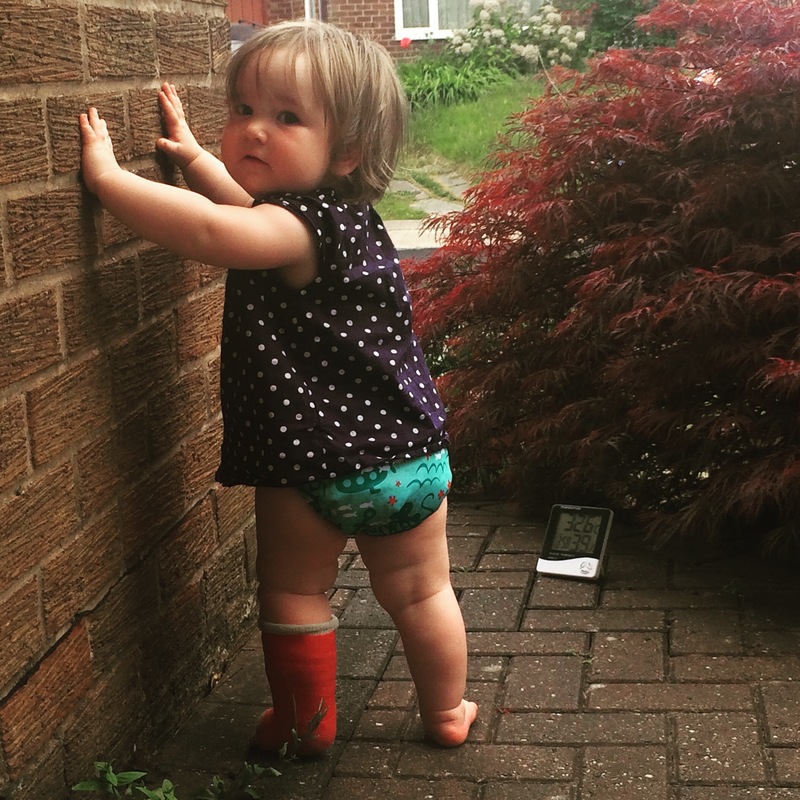 Thankfully C still slept well and after some initial frustration at not being able to get down and toddle round she soon became accustomed to her new footwear and rediscovered her ability to crawl at a lightning fast pace. Back home and with a new ‘proper’ cast on (again the NHS were fab despite her protestations at, God forbid, being made to sit still for all of 5 minutes), we had the welcome news that kids of her age really do heal quickly, and got a date for the cart to be removed after just three weeks. Apparently it was likely to have healed after two but the extra week was just to be sure, and this seems to have been proved right, as we’re now coming up to ‘cast off’ day and C is happily toddling around on her cast, far less bothered than us by the increasing whiff coming from it as we swelter in a UK wide heatwave. Of course, despite the whole experience we still can’t keep C away from the stairs, so much so that she’s learnt how to shut the stairgate behind her as she goes up.